For some children, being a generous giver and a gracious receiver are natural. But other children may need more time and more help from us … When we show children we care about their feelings and that we enjoy giving and receiving, we help them understand how much we receive when we give and how much we give when we receive. Since I mostly use the television as a babysitter, I am only partially aware of what Cora is being exposed to when she’s watching. This is definitely at the top of parenting guilt list, but it’s just the way things go around here sometimes as I try to be a full-time mom and part-time professor. This week, we discovered the PBS series Daniel Tiger’s Neighborhood on Netflix. 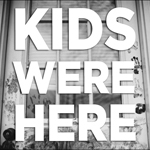 From what I picked up in passing and from my perch at the kitchen table, I liked the way Daniel addressed real life topics that were age-appropriate and that the music wasn’t too terrible. I even recognized the theme song as a throw-back to Mister Rogers’ Neighborhood, which I can remember watching as a child and even made reference to in my dissertation. Curious, I turned to The New York Times (my trusted source for great television reviews) and found a nice background story that outlined the connection between the two programs. As it turns out, Daniel Tiger is an intentional reincarnation, cooked up by the same people that brought us Mister Rogers. I love the fact that the main objective of these shows is social-emotional development as opposed to mastery of the ABCs and 123s. Parents can read more about this on the program website, including timeless quotations from Fred Rogers like the one at the top of this post. Talking about feelings isn’t easy for anyone, let alone an almost 3-year old. While Cora hasn’t seen Mister Roger’s yet, Daniel seems to be reaching her in some powerful ways. In the past week I’ve caught her singing a song about stopping to look both ways before you cross the street and playing school with her dolls, both direct outgrowths of what she’s seen on the show. These are pertinent topics for her to consider at this time – she’s been spending lots of time riding her tricycle around our neighborhood this summer and is anxiously awaiting a bit of preschool in the fall. All this was great, but I was sold when I heard Daniel singing “Making something’s one way to say, I love you.” Regular readers know I am a big fan of anything handmade and that I’m working to instill that love in my kids (see, for example, Crafty Cora and My Step-Monster’s Kitchen). But it wasn’t just the song. As Daniel made a card to send to his father to show him that he loved him, Cora got out some paper and crayons and announced she was making a drawing for her dad. While I helped her write a few letters and open a drawer or two, she was nearly on her own for this one. I was amazed to listen to her talk about what she wanted to do and to use skills we’d practiced in the past but hadn’t utilized in awhile. Nothing short of amazing. As was the love she was expressing for her dad. I only wish he’d been home to see and hear it. This month we’ve been reading a lot of fariy tales. It wasn’t planned, it just sort of happened. When we go on vacation, I usually grab as many soft-cover picturebooks as I can find on our home library shelves. They pack nice and tight and they don’t weigh much. When Cora and I went to the beach with my family last month, I brought along The Story Tree: Tales to Read Aloud (Lupton/Fatus, 2005), a book she received for her first birthday (thanks Shannon!) but we hadn’t really spent much time with yet. The book contains stories from around the world including a few classics that have been retold and become classics of their own. For example, fans of Tomie de Paulo’s Strega Nona (1979), will surely recognize” The Magic Porridge Pot,” a story attributed to Germany. And one of Dan’s all time favorites, Caps for Sale (Slobodkina, 1940), appears here as “Monkey-See, Monkey Do” (India). We read The Story Tree from cover-to-cover on the airplane and, as we were getting off, the woman in front of us actually thanked me for the readings. We read the stories again throughout our trip at breakfast and at rest time with my niece and nephew. Perhaps that set us up to see more fairy tale books when we returned to our public library back home. Here are a few we’ve liked. Lame, I know. What would you say? I’m open to suggestions. The illustrations are bold and bright, though I’m not wild about some of the captions. For the most part they are redundant with the text and seem superfluous. People who know me well won’t be surprised that I have been avoiding princesses and princess stories as much as possible – I don’t want Cora to be a pawn in Disney’s business plan – but we found a nice version of Cinderella (Eilenberg & Sharkey, 2008) that offered a decent introduction. The drawings are soft yet stylized, using colors and shapes to help evoke the step-mother’s wickedness and the sisters ugliness. As a step-mother I have some issues with this story, but in the end that’s all it is, a story. And a classic one all children, boys and girls alike, ought to read at least once. I’ve saved the best for last as far as both text and image are concerned. 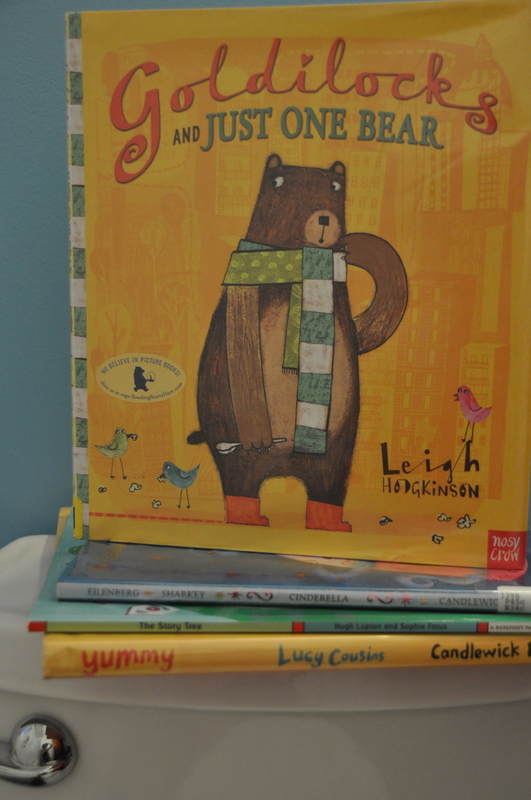 Goldilocks and Just One Bear (Hodgkinson, 2012) offers a great spin on the classic tale. A bear gets lost in a big city and finds himself in a penthouse that belongs to a dear old acquaintance. Nevermind that in any city with a building this fancy – the elevator opens directly into the apartment – one would likely find a doorman who would have kicked the bear to the curb. The text is fun to read with enough that is like the old story to make kids feel like they know what’s coming next and enough that’s new to keep them paying attention. The illustrations are quirky and full of silly details that make repeated readings exciting. Summertime seems just the right time for fairy tales; a time of suspended reality. You tell me, what should we read next? This is the second fixation Cora has had with a movie. Toy Story was first and it had me worrying a bit. What could watching the same movie again and again be doing to her little brain, I wondered. Then, I remembered that our music teacher touted repetition as an important part of toddlers’ cognitive development as it related to music. Could film work the same way? Like reading the same book over and over again, which I am also known to do upon request. Articles like this one from a child psychologist on an Australian parenting forum, also helped me recognize that these fixations, rather than obsessions, are innocent and may even be beneficial to some degree. If every moment of every day were filled with cars, if she wouldn’t ever watch anything else, if she couldn’t play any other games or with any other toys – then we’d have a problem. 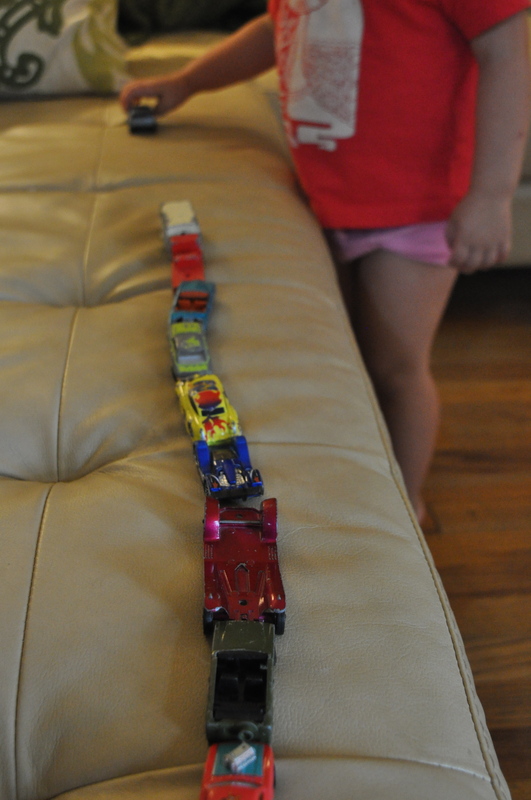 And so, we’re off to listen to the Cars soundtrack while playing with cars, in the car. Those who know me know that I love to sew. I came to this later in life, as a way to pass the time in graduate school. Like doing dishes, it was a way to keep my hands busy with little things while my brain was processing big ideas. Over time I’ve taught myself to read patterns and, eventually, experimented with how to alter them. I’ve taught Rosa and George how to run my sewing machine and even Cora has pushed the peddle for me from time to time. As I’ve written about here before, I don’t think it’s ever too early to instill an appreciation and love of hand-crafting in kids. So, I was absolutely delighted today when Cora picked up some felt, needle and a thread I’d set by my side and began mimicking the running stitch she’d just seen me using. 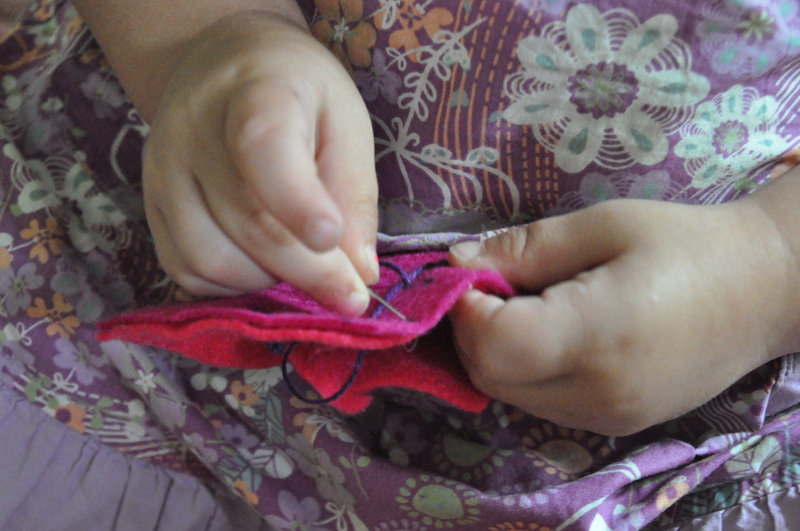 She excitedly held up her work to show me how she stuck the needle through one side and pulled it out the other end. And I excitedly ran to grab my camera. Friedrich Froebel, the inventor of kindergarten, used 20 activities to introduce young children to a variety of skills. He called these “gifts.” Sewing cards were number 12. Watching Cora today, I understood the real meaning of that label. She was so pleased with her work. She knew that she was on to something big. And I can’t wait to help her do even more. I’m not really sure I need to write anything about this one. But here goes. Since we still have a construction site in our house (our new kitchen should be finished any week now – more on that later) we have a dedicated space for making great big messes. 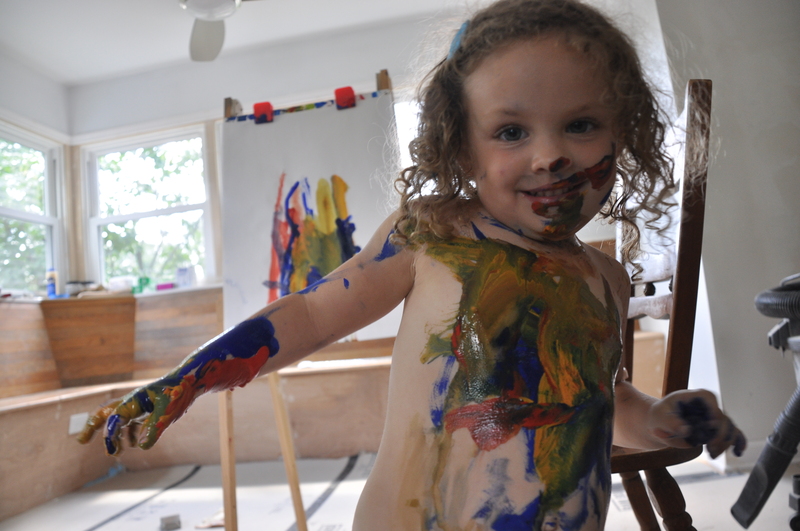 Combine that with temperatures in the 90s that were perfect for a hose down or two, and I was perfectly happy to let Cora paint as freely as she wanted. Child, and her mother, couldn’t be happier. When I started this “A Photo a Day” mini-series last night, I promised to post six photos, one representative of each of the past weeks I haven’t written anything here. But tonight we honored a family tradition too exciting not to write about right away. Every July, Goodguys Rod and Custom Association convene at the Ohio State Fairgrounds. Our family is happy to have our city play host to this somewhat motley crew as they give us great access to hundreds of hot rods and custom cars you won’t see on the streets everyday. It was a breeze convincing our Cars-loving Cora to come along for the ride to “the big car party.” She was visibly excited to see so many cars that looked like ones she’d only seen in the movie. It helps that her dad alternates between a 1972 Chevy pick-up truck and a 1970-something Honda motorcycle on the weekends. She and her siblings are growing up around old motored vehicles, much like their Dad did. Many of Dan’s childhood memories seem to involve cars. His mom and dad met at a drive-In in the 1960s. 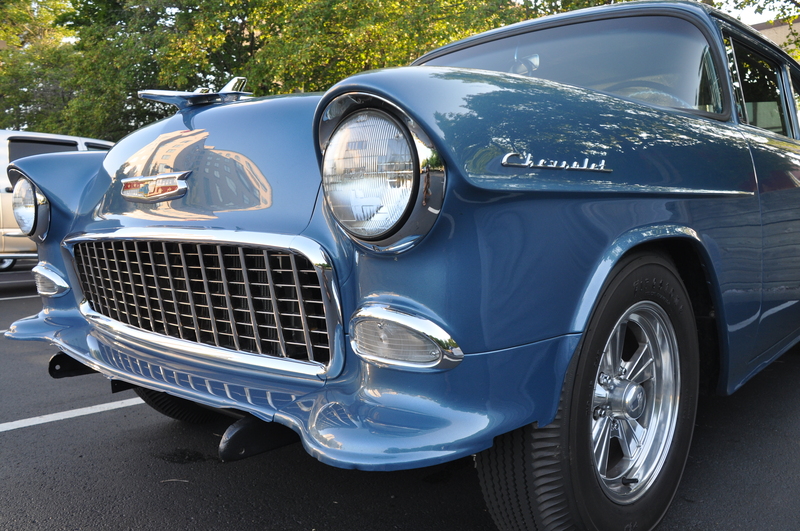 His dad kept classic cars around and maintains a soft spot for Corvettes. He learned to drive on a 1964 Mustang. It’s funny that I find all this attractive since my preferred mode of transportation is my bicycle. But for some reason I do. Part of it is the tradition. And part of it is related to art appreciation in the truest sense of the term. Dan and his dad can name a car by make, model, and year from a half mile off. Sadly, his dad’s memory isn’t what it used to be, but when he was watching the cruise tonight, he seemed to remember clear as a bell. George is learning the language and may someday carry on the family knowledge. If not, Cora seems primed to become the gearhead her dad’s always dreamed of having for a child. I was so amazed by Dan’s knowledge of the cars we encountered. I’d say, “I really like that green one over there.” And he’d say, “Yeah! Those _______ (insert make, model, and year here) are great. They had/added those _______ (insert part of the body, engine, or detailing here) that no other car had/has.” This nice Jewish girl from Long Island was smitten by all the talk of chrome and steel. And, if you listen to Robert Hughes talk about 1950s cars on American Visions, you’ll understand why. (If you click this video link, skip ahead to 9 minutes, 20 seconds). Tonight, as we walked the lots and sat on a berm watching the cars roll by, we were all connected to one another and the folks around us by something that spans time and space. I loved listening to Dan’s mom go back and forth with some ladies nearby as they tried to recall the color of the 1956 Thunderbird Suzanne Sommers was driving in American Graffiti (it was white), and I’m happy our kids are learning to appreciate these Modern marvels. I am out of practice writing so I decided to start my next few posts with a photo, one from each of the past six weeks since I was last writing with regularity. On the catwalk. Rosa, third from the right. Instructor, Jen Gillette, second from right. This camp had it all. Pop culture hooks, introductions to a wide range of media and techniques (without getting too technical), and space for personal exploration and expression all delivered by a hip young instructor who openly shared her own passion for fashion and unique means of approaching getting outfitted. Jen is the kind of art educator I wish I could be. Creativity seems to ooze out of her and, in our conversations, she showed an authentic interest in sharing that with Rosa and her peers. I wish I could write more about the particulars of what went on each day, but I wasn’t there and teenagers aren’t that great with details. Like most of the weeklong camps the kids attend, this one ended with show-and-tell Friday afternoon. But this time it wasn’t a static display of drawings and paintings on a wall. This was a full-blown fashion show complete with a runway set between rows of neatly aligned black folding chairs and music perfect for prancing in high heels. It felt special to walk into that space as a viewer. And it was evident that the girls felt special as they paraded down the isle, striking poses for the cameras at either end. With this, Fashion Blasters! 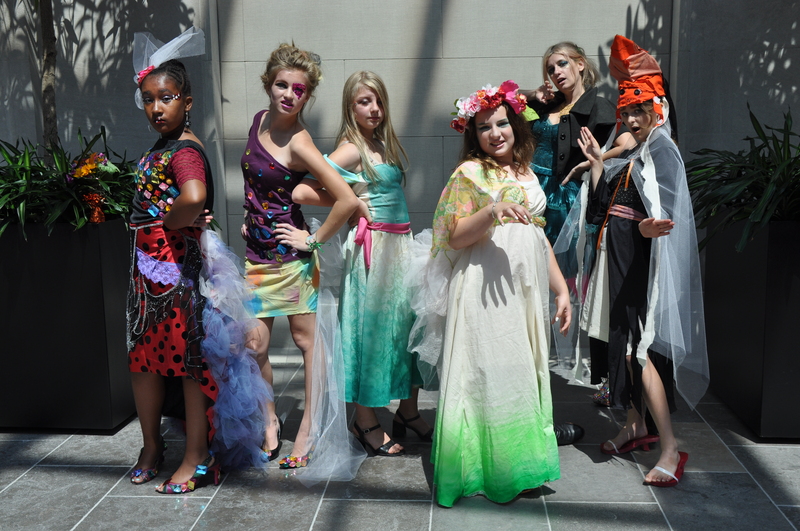 created just the sort of spectacle art educators ought to be creating to gain attention for our programs. *While the workshop was advertised as co-ed, no boys enrolled.